With the new, facelifted G11-generation BMW 7 Series having shown its enormous grille earlier this year, it was only a matter of time before we’d lay our eyes on a new Alpina B7, which is essentially a 7 Series that has been swag-ified by Bavarian tuning company Alpina. The biggest bit of swag is in the engine bay. No, it’s not the 600 horsepower 6.6-liter V12 found in the M760i xDrive, it’s actually a modified version of the smaller, 4.4-liter V8 found in the 750i xDrive. But despite the lower displacement, Alpina’s changes have brought the power figure up to match the V12's 600 ponies, and torque is only 37 lb-ft down on the big motor at 590 lb-ft.
Those numbers are the same as those of the 2018 Alpina B7 we tested last year, but they’re still significantly higher than the 523 HP, 553 lb-ft of the 750i BMW says on its media site that the new Alpina can rip from zero to 60 mph in only 3.5 seconds, or 0.1 seconds quicker than before, and can hit a top speed of 205 mph, whereas the outgoing car was limited to the low 190s (BMW’s media site says 194, its consumer site says 192). The exhaust side of the turbochargers are equipped with a 54 mm (previously 50 mm) diameter impeller. Additionally, the ALPINA-specific intercoolers feature an interconnection to equalize and reduce pressure pulsations between the two cylinder banks of the V8 engine. Aesthetically, there’s a new front bumper with “Alpina” lettering on the bottom and exclusive paints, and there are still those beautiful 20-spoke Alpina aluminum wheels available (20-inchers are standard, 21s are available). On the inside, like before, there’s Alpina detailing, including a steering wheel with blue and green stitching, special interior trim options, a production plaque, and a digital instrument display specially designed by Alpina. 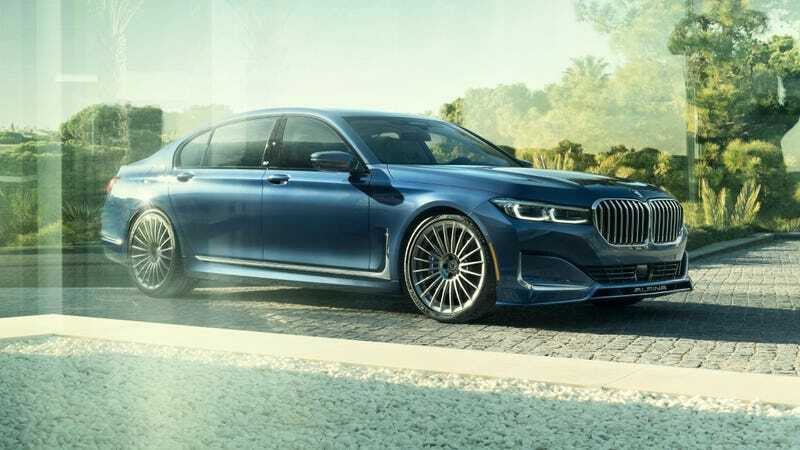 The press release mentions a bunch of other changes that Alpina has made to the 7 Series bones, including transmission tuning to the ZF eight-speed, the exhaust system, the steering tuning, the cooling system design, and all-wheel drive calibration. You can read more about that here. The 2020 Alpina B7 will have a suggested retail price of $142,695 (including destination) when it launches in the third quarter of this year.